The York Lunatic Asylum was founded in 1777 and typified this approach to the disabled. Fortunate patients from wealthy families were relatively well-treated while poor patients suffered through straightjackets, restraining chains, inadequate food, and little supervision or protection. But all patients, even wealthy ones, were subject to such “treaments” as purges and cold baths. Deaths among the poor patients were common but they were not reported. Since the asylum was private there were no government inspections, and so there was no way to evaluate how well “treatment” was working, or if there was any attempt at treatment at all. Interesting post. 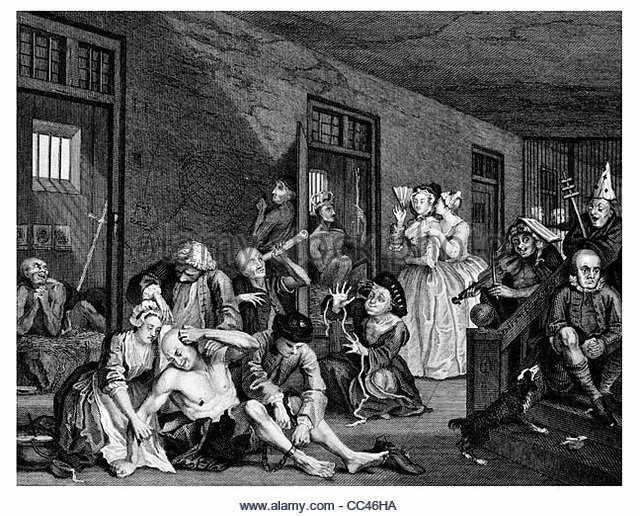 In my genealogy research I came across an ancestor who was in such a home although this home included both what they considered “lunatic” and “poor and elderly” so I always wondered for which reason she was institutionalized. Either way, I feel saddened by the kind of “care” she probably received at such a place. Oh, how sad it must have been to find that! Geneaology is fascinating for the things we discover, but it’s not always happy. Elaine, thank you for sharing this interesting post! I’m glad you liked it! Thanks, Caryl! Interesting as always. When I was researching the London Hospital (Now called Royal London Hospital) for Darcy’s Melody, I read that in London, the place folks were sent to was Moorefields. My very minor character, Mr. Paul Blakemore was suffering with a head injury and memory loss. Had the Bennet sisters not helped to locate his family, he most likely would have been sent there. Thank goodness we have many support groups and services available for folks with disabilities these days. Yes, we can be thankful for the greatly improved facilities our disabled population now enjoys! I’m also thankful for the greater transparency and regulation that has been brought to bear on these institutions. Thanks, Regina. It was fascinating to research. I had no idea how influential the Quakers were in the field of mental health. One of my very dear friends has an autistic daughter and another has a daughter with Downs. To imagine either of those sweet girls in this kind of system makes me sick to my stomach. I’m thankful we’ve come so far yet, as you said, there will always be the fight with society. I wrote a paper for one of my college classes about the public (and even political) climate treats people with Downs and used our spunky light of our life little girl as my base subject and it was painful to see some of the things that were said British author Richard Dawkins has said that if you know ahead of time, “it would be “immoral” to carry on with a pregnancy if the mother knew the fetus had Down’s syndrome”. Another intimated she should be killed because she can not be a productive member of society. When I see the sunshine of her smile and her unequivocal love of people, I want to just smack these people. I digress. Very interesting post and good for the Quakers!! Stephanie, my long-time friend has a Down’s syndrome sister, who is now in her late 50s. She was born well have her brothers and sisters. My friend still oversees her care. I used my personal experiences with Vicky to shape two of my characters. In book 3 of the Realm Series, A Touch of Cashémere, the hero’s brother has what we now call “Down’s.” As Dr. John Down, who called the disorder “Mongolism,” did not bring his findings forward until about the time of our American Civil War, people with Down’s in the Regency would have been confined to asylums. There are ramifications for the earldom because the character with Down’s would have been the rightful earl, but his younger brother, the hero, serves as his regent. The hero hires a young man to serve as the “tutor” for his brother rather than to permit him to be confined. I also used a Down’s character in my contemporary romance “Second Chances: the Courtship Wars.” In that one the Down’s character has a “boyfriend” at the daycare facility, where she spends her days. Having taught special education for a good while, I was familiar with the “relationships” of some of my students, and I incorporated those observations in the story. Regina, I am so impressed that you would include characters with special needs into your novels. You make me want to cry! FYI: It’s Down Syndrome. I worked for a number of years with those diagnosed with IDD (Intellectually Developmentally Disabled). Some had very supportive families who took advantage of community resources while others abused their own family members. I refused amniocentesis when pregnant after many years of fertility treatments saying I would take whatever GOD gave me and since that test had a risk of then causing a miscarriage I didn’t want to risk that happening. There is an unpublished story about Darcy being deaf from having measles when young and then having a speech impediment when he attempted to talk. He suffers the scorn and abuse of the community as they learn of his condition. The author researched that condition and how it was treated in that era for her story and it was very touching. Good for the Quakers indeed! Yes, we’ve come a long ways, for which I am thankful; yet there is still a lot to do. Can you imagine someone a sensory processing disorder, like hypersensitivity to sound, being stuck in one of those asylums back in the day??? My daughter would have regressed, severely, in such an environment. It’s a scary thought the way people with disabilities were treated back then. My daughter has Schizo Effective Disorder. She would definitely have been in one of these places if she had been born back then. From my experience of mental health now, I think it’s very important for the sufferer to be among family and in familiar places like home etc..
On Darcy and Elizabeth having a child with disability, I think it would have been ‘farmed out’ so to speak. Look at Jane Austen herself. Her brother was sent to other people to be cared for and we have little information about him. It’s like he didn’t exist. In that at least we have come a long way in our thinking thank goodness. Thanks, Teresa. I have long thought that writing a story of Darcy and Elizabeth with a special needs child back in the day would be just too utterly depressing to write, but I may have to revise that idea. 🙂 I would love to chat with you sometime about schizoaffective disorder, as another relative of mine was just diagnosed with it. A future blog entry will be devoted to Jane’s brother. I only recently became aware of his existence.